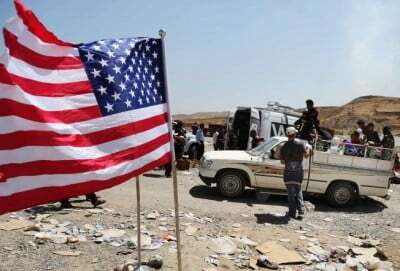 On Friday the 30th of October, U.S. President Barack Obama announced that he will send 50 U.S. Special Forces soldiers into Syrian territory, though Syria has presented no threat to U.S. national security and has not invaded any country. In fact, Syria is fighting against Islamic jihadists who present a threat also to the United States and Europe. The U.S. is invading Syria (first with bombers, and now even with its first troops) to overthrow Syria’s elected President, whom even Western-allied polling shows still to be supported by a majority of Syrians. When America’s ally the Qatari regime, which funds al-Nusra (al-Qaeda in Syria), hired a polling firm in 2012 to survey Syrians, the finding was that 55% of Syrians wanted Assad to remain as President. Then, as I reported on 18 September 2015, “Polls Show Syrians Overwhelmingly Blame U.S. for ISIS,” and those recent polls were from a British firm that has ties to Gallup. Russia, in contrast to America, hasn’t invaded Syria at all, but was instead urged to assist the elected government in its defensive war against the invading islamic jihadists and American bombers; and Russia is now providing the requested assistance. What right does the U.S. have to invade Syria, and to assist Sunni forces to overthrow the Shiite President of Syria, whom polls show to be still supported even by a majority of Syria’s Sunnis? None that I can see. Consequently, shouldn’t the Syrian Government be seeking compensation from the United States? When will the request come? How will the request come? The damages from U.S. bombing of Syria’s infrastructure are already enormous. The U.S. asserts that it is supporting ‘democracy’ but is actually allied here with two dictatorial totalitarian theocratic-royal regimes, trying to overthrow the Assad government, which is neither totalitarian nor theocratic, nor even royal, though the current leader (Bashar al-Assad) wouldn’t have come to power if his father’s party hadn’t chosen him to become their leader. That’s not quite the same thing as in Saudi Arabia and in Qatar, which are absolute monarchies and entirely dependent upon the clerics for their right to rule. But the U.S. allies with them, against Assad. The U.S. is, of course, trying to help the Sunni royal families, the Sauds of Saudi Arabia, and the Thanis of Qatar, impose a Sunni government also on Syrians, so that Syria can then become a pipeline-route for Qatari (or Thani) gas and Saudi (specifically King Salman’s) oil, to flow into the EU, which the United States wants because the U.S. Government is trying to force Russia’s (extremely popular) President Vladimir Putin out of office, and is trying to choke the Russian economy in order to make that happen — and strangulating Russia’s oil-and-gas sales to Europe is an important part of that strategy. The U.S. aim is a failed Syrian state, so Russia will lose an ally. Thus, on October 13th, Brandon Turbeville headlined, “As Russia Bombs ISIS, US Bombs Syrian Civilian Power Stations.” The U.S. is trying to destroy Syria; Russia wants to salvage Syria. So: while Russia bombs ISIS and other jihadists, the U.S. bombs Syria’s infrastructure. A nation without the infrastructure to hold it together is a failed state — America’s goal. The U.S. doesn’t announce this as its goal. Instead, the U.S. says simply, that Syria’s President, Bashar al-“Assad must go,” or, “the time has come for President Assad to step aside” so that there will be “a new government, without Bashar Assad.” This is like George W. Bush’s constant demands for “regime change in Iraq.” Who gave the U.S. the right to replace nations’ leaders and still claim that doing this doesn’t constitute an international crime, of aggression, if not of aggressive invasion — the war-crime for which Nazis were hung at Nuremberg? By what right does the U.S. do any of this? Why isn’t the International Criminal Court publicly (very publicly) seeking jurisdiction to investigate that? Will one of the U.S. news editors (there are over a hundred of them) who receive each of my news reports and commentaries submitted for publication but who have never published any of them, please now publicly address this question in their news-reporting? I here ask each of them: if you think that the U.S. possesses the right to do this, then will you please publicly explain why? Or, if you won’t, then will you please publish this article that poses this question, so that your readers or audience may consider the question? This article is being sent to virtually the entire U.S. news-media. Let’s see if any of them publish it — or else explain why they support the U.S. invasion of Syria.